Top executives from Marathon Petroleum Corporation were grilled by members of Detroit City Council, following a foul odor emanating from their refinery this past weekend. At the meeting, the MDEQ publicly stated the company would face fines yet to be determined. However, the company representatives would not speak with media following the meeting. 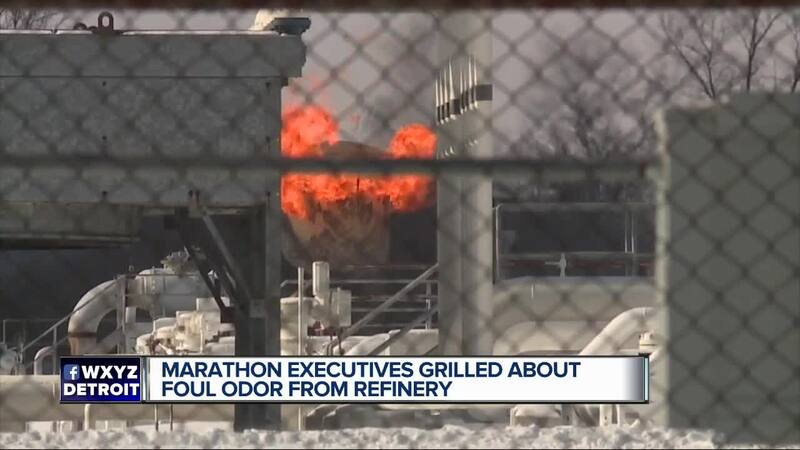 DETROIT (WXYZ) — Top executives from Marathon Petroleum Corporation were grilled by members of Detroit City Council, following a foul odor emanating from their refinery this past weekend. At the meeting, the MDEQ publicly stated the company would face fines yet to be determined. However, the company representatives would not speak with media following the meeting. Council President Brenda Jones scolded the company representatives for not informing the public about concerns in a more timely manner. “We expect to have an evacuation plan if needed and a way for all people including those without phones or computers to know what’s going on,” Jones said. The company said the cold was to blame for a malfunction. However the odor was not toxic. They added that they are working to make sure they don’t have anymore problems such as those over the past weekend. Council says they are not done getting answers for the community. They’ll be holding another meeting to ask Marathon more questions in the next few weeks.